Fancy a hill walking challenge? Fed up with climbing those same old favourite mountains? Ever thought that there are many more worthwhile peaks to climb out there? Are you keen to explore in depth the various mountain areas of Britain? Want more of a structure to your hillwalking days, a goal, a long-term aim? If the answer to any of these questions is “yes” then the LDWA’s Hillwalkers’ Register (HR) is for you. If you are in the happy position of being able to make a claim, this must be done on the official downloadable Claim Form. For a copy of this, click here. (Sorry, but to simplify the administration all claims must be in the same format: the Recorder can't accept claims by letter or email.) But please, read all of this Introduction, and also the introduction to the Register that you have completed, before you submit your claim. This could save a lot of unnecessary correspondence ! Communications with the Recorder other than claims should preferably be made by email, to hillwalker@ldwa.org.uk . The contact address for postal communications is given later. No phone calls, please ! 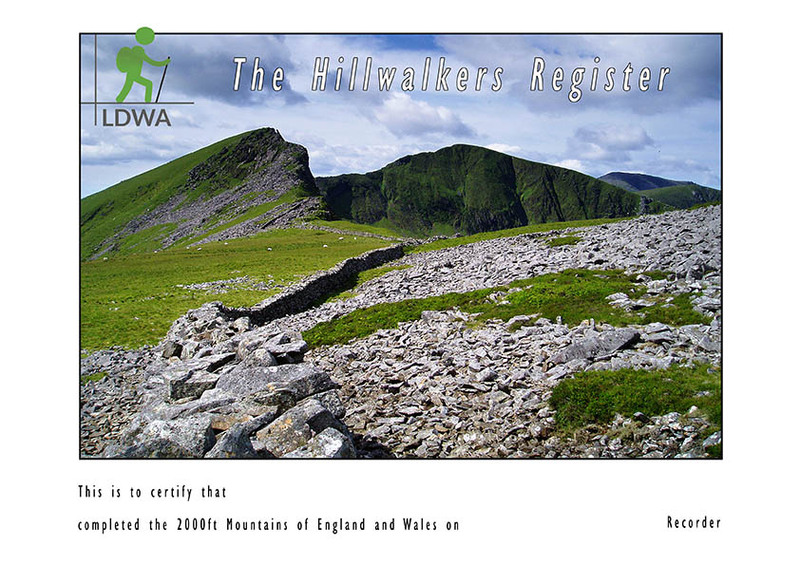 The Long Distance Walkers Association (LDWA) keeps records of hillwalkers who have completed a "round" of various lists of hills in England & Wales, and Ireland (and a few in Scotland, although there are other organisations, in particular the Scottish Mountaineering Club, which keep the main records for Scotland). 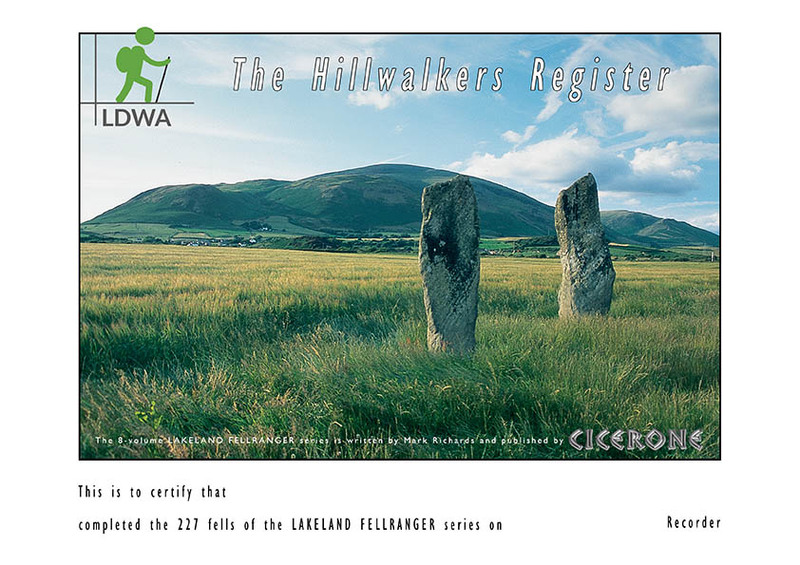 The Hillwalkers’ Register (HR) takes the form of five Registers, numbered 1 to 5, which contain the names of those who have completed recognised lists of hills. Some of these Registers are split (A, B, etc. ), and so the practical position is that there are ten Registers, as listed below. 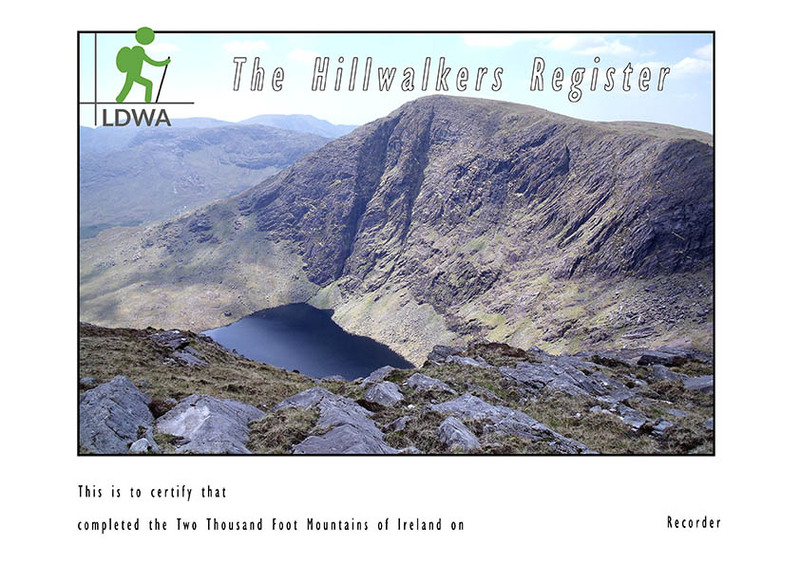 At the end of 2017 there were 1,473 separate entries in the Hillwalkers' Register, from 953 different walkers. Thus on average each walker has completed just over 1.5 registers. 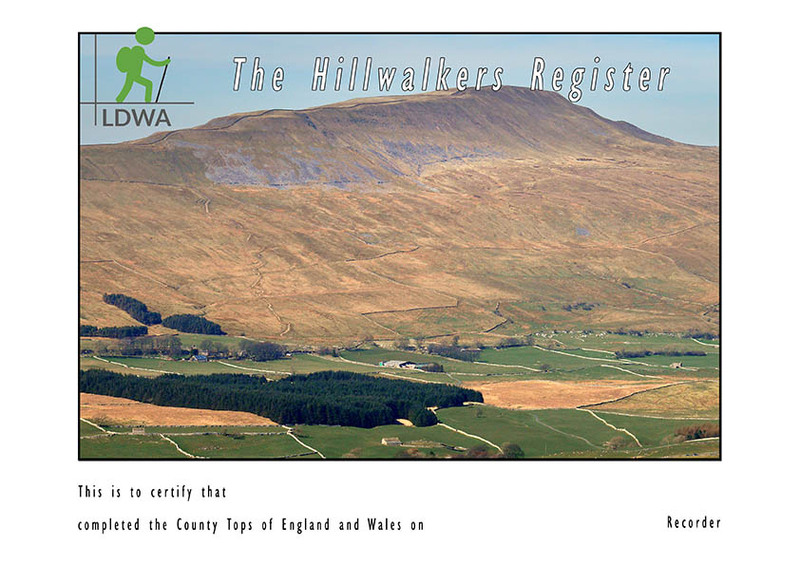 The vast majority have completed one or two registers, but some have many more and three walkers have achieved the "Full Grand Slam" of all ten registers. In the HR Annual Report, details of new entrants to each register during the year are published. 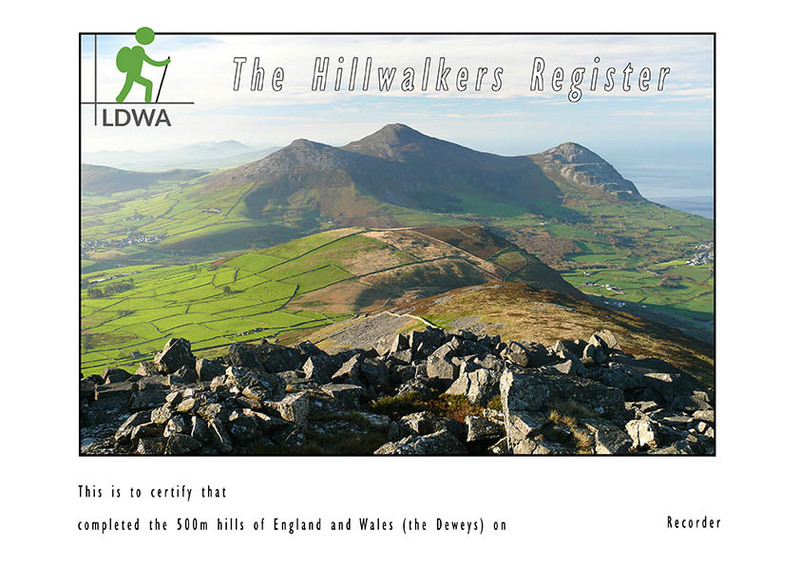 (It is no longer practical to publish the full list of over 1,400 entries each year, but these can be found on the LDWA Hillwalkers' Register website.) The most popular registers are those of the 2,000ft Mountains of England & Wales, the Wainwrights, and the Outlying Fells. Yearly “Tables of Progress” are published in the Report for some Registers (e.g. the Deweys). A Table of Progress contains data on the number of summits in a list of hills so far climbed by each hillwalker who is actively collecting these hills, and can act as a spur to greater activity! I am sometimes asked why "England & Wales" is treated as a single country. The short answer is that the early compilers of lists south of the Border did just that. I have some sympathy with the view that there should be separate registers for England and for Wales. But the practical position is that it would now be quite impossible to gather the data from all those in Registers 1, 3A and 5A to enable a split to be made, and so things must remain as they are. Please note that a few of the hills on the Register lists are on private land where there is no legal right of access. In these cases hillwalkers are reminded that it is ONLY permissible to climb these tops if prior permission has been sought and granted from the landowners. If access is denied then entry to the HR will still be granted if these hills are omitted from your hill list. Please inform the HR Recorder of the hills to which you were denied access when you send in your completed Claim Form. If a sign is encountered denying access then please do not ignore this. Neither the HR nor the LDWA condone irresponsible behaviour in the countryside and do not encourage trespass. 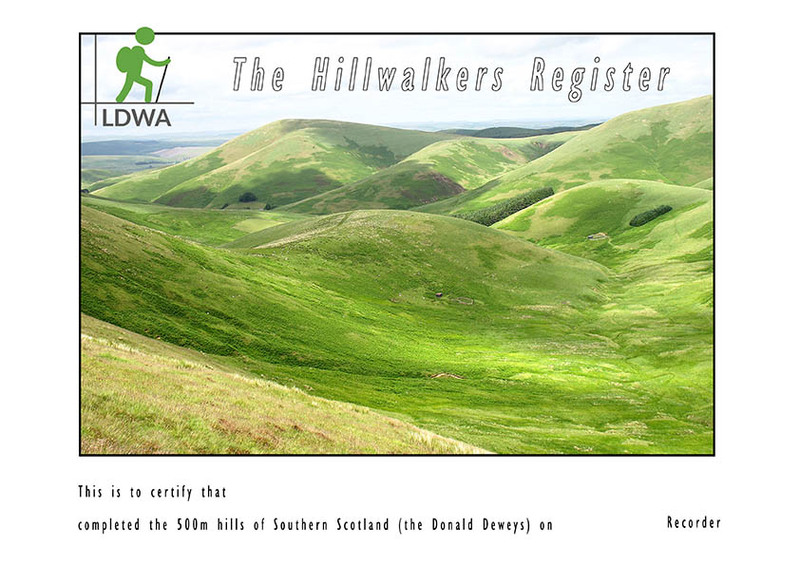 The existence of the Hillwalkers’ Registers is not an encouragement to break the law, interfere with landowners’ privacy or trespass on land to which there is no legal access. The HR and the LDWA will not be held responsible for any actions that result from ignoring these warnings. Neither the LDWA nor the HR will accept any responsibility for accidents or other mishaps that may occur in pursuit of the hill and mountain summits on the HR lists. Safety is the responsibility of the individual and all people attempting these challenges should be sufficiently experienced and adequately equipped. As there is no "official" list of summits, claimants must state the list used for their completion. The following published lists are acceptable: Simpson (1937) & Moss (1939 & 1940), Bridge (1973), Buxton & Lewis (1986), Nuttalls (1989 & 1990), Dawson (1992) and Dawson (1997). The use of Wright (1974) together with one of the lists of the Welsh summits in the above publications is also acceptable. A copy of any other list used (a full list of summit names and grid references), including the claimant's own, must be forwarded with all applications for inclusion in the Register. It is anticipated that most completions these days will be of the Nuttalls or the Hewitts (the latter listed in Dawson, 1992 and 1997). A completion without the ascent of Pillar Rock (a "moderate" grade rock climb) is acceptable, although it should be clearly stated whether or not this peak was included in the round. Most authors have traditionally analysed the summits of both England and Wales together, and consequently the two countries will not be considered separately, i.e. only the names of those who have ascended the summits of both England and Wales will be recorded on the Register - a register of the separate completions of the summits of either England or Wales will not be maintained. The ascent of the summits of both countries is a considerable challenge to the hillwalker, and those ascribed to the Register can be justly proud of their achievement. At the end of 2017, 252 hillwalkers had claimed a round of the 2000ft Mountains of England & Wales on the Hillwalkers’ Register. The first two Registers consist of the names of those individuals who have reached the summit of all the hills featured in Wainwright's Pictorial Guides to the Lakeland Fells. Register 2A lists all those who have ascended the 214 peaks described in the seven Guides; Register 2B lists those who have climbed the additional 116 fells described in The Outlying Fells. Please note that the term "Wainwrights" as given above, for the hills listed by Wainwright is only used for convenience - it is a term that AW would surely have detested! Register 2C lists the names of those who have ascended all 541 Birketts in the Lake District. Register 2D lists the names of those who have climbed all 227 fells described in the eight-volume Lakeland Fellranger series, written by Mark Richards and published by Cicerone. At the end of 2017, Register 2A contained 793 names, Register 2B contained 157 names, Register 2C contained 75 names and Register 2D contained 66 names. Claimants must state the list used for their completion. The following published lists are acceptable: Pre-1974: Moss (1951), Bridge (1973), Post 1974: Climber & Rambler magazine (1975), Dillon (1985), Strider magazine, (1990), Dawson (1992), Dewey (1995), Dawson (1997) and Hardy. A copy of any other list used (a full list of top names and grid references), including the claimant's own, must be forwarded with all applications for inclusion in the Register. The list according to Dillon (1985) is acceptable. More up-to-date and useful information on the Irish County Tops is also contained within Clements (1997) and Gribbon (Ireland's County High Points, 2012). See also www.mountainviews.ie State whether or not the six counties of Northern Ireland were included. A copy of any other list used (a full list of top names and grid references), including the claimant's own, must be forwarded with all applications for inclusion in the Register. At the end of 2017, Register 3A contained 63 names and Register 3B contained 25 names. Claimants must state the list used for their completion. The following published lists are acceptable: Vandeleur & Lynam (1950s), Wall (1980s), Dillon (1992), Lynam (1990s), Clements (1997), Edmondson (2005) and www.mountainviews.ie. A copy of any other list used (a full list of summit names and grid references), including the claimant's own, must be forwarded with all applications for inclusion in the Register. At the end of 2017 there were 19 walkers in this register. Probably many more are registered with Mountainviews.ie. A Dewey is defined as a hill in England & Wales that exceeds 500 metres in height above sea level, but is below 609.6 metres (2000ft); it must be separated from adjacent tops by a drop of at least 30 metres on all sides. At the end of 2017 there were 426 hills accepted as Deweys, and just 13 people had claimed to have climbed them all. A “Table of Progress” of hillwalkers’ achievements with this list is published each April in the Annual Report. A completion without the ascent of the tor on the summit of Great Links Tor (a high grade rock climb) in Dartmoor is acceptable; please state whether or not this was climbed when submitting the Claim Form. A Donald Dewey is defined as a hill meeting the same height and drop criteria, but situated in the Lowlands of Scotland (the region in which Percy Donald compiled his list of 2000ft hills, published in 1935). Completers are recorded in Register 5B, and a “Table of Progress” for this list is published each April in the Annual Report. At the end of 2017 there were 248 hills accepted as Donald Deweys, and just 10 walkers who had claimed an entry on this register. Retrospective claims as well as current ones are acceptable. There is no time limit. Please ensure that the claim is signed. A claimant other than the "completer" will only be accepted if the latter is deceased or otherwise incapacitated (e.g. a friend or relative might like to provide the information). In this case please provide the full name and address of the claimant, the date on which the "completer" died (if relevant), and details of your connection with the completer..
Claims will only be accepted on an official Register Claim Form downloadable from this website or available free from the Recorder on receipt of an SAE. Alternatively a Register Claim Form may be obtained as an email attachment by emailing the Recorder (see email address below). The form consists of two A4 pages, which will only take a few minutes to complete. One form per person per Register please. Answers to some of the questions, e.g. date of birth, are optional. Completed and signed forms must be posted (not emailed back) to the Recorder, who will then record the names of the “completers” on the relevant Registers. Entry to the Registers is free of charge, but for a commemorative certificate please also send a cheque for £3.00, a fee that includes post and packaging in a large stiff envelope. For a special HR badge send a cheque for £1.50 (see below - cheques made out to the LDWA please). Claims will be entered on the appropriate Register, which is kept on a computer file, and is the property of the LDWA. An acknowledgment will only be sent if the claimant includes an email address or a stamped self-addressed postcard. Annually updated Registers, containing the names of the "completers" who made a claim within the last year, are published every April in the HR Annual Report despatched with Strider, the magazine of the LDWA (available to members only - click here for further details.) The HR Report is usually 24 pages in length and contains a wealth of information, articles and items of interest to the hillwalkers and peakbagger. High quality certificates, A4 size, are available from the Recorder. 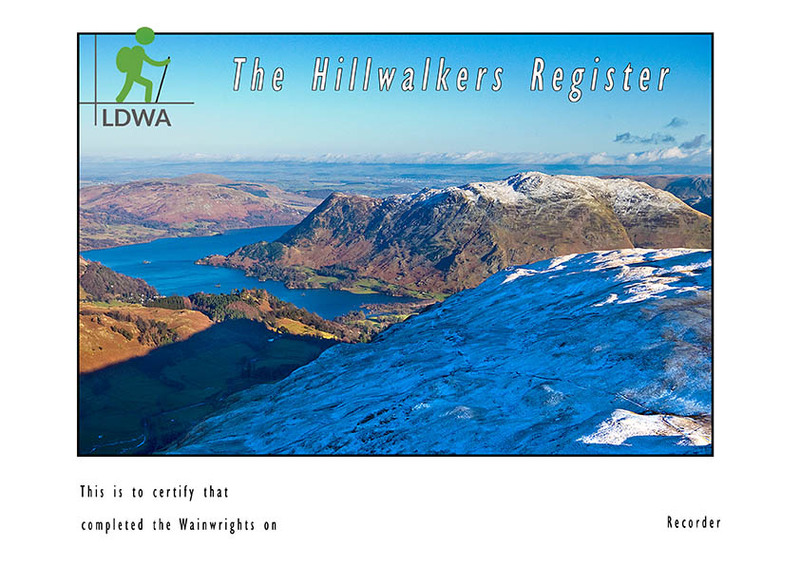 All those hillwalkers who have satisfied the requirements for entry into the Hillwalkers' Registers are eligible for a certificate. There are certificates for all the Register categories, viz. the 2000ft Summits of England & Wales, the Wainwrights, the Wainwright Outlying Fells, the Birketts, the Fellrangers, the County Tops of England & Wales, the County Tops of Ireland, the 2000ft Summits of Ireland, the Deweys of England & Wales, and the Donald Deweys. To claim your certificate simply send a cheque for £3.00 per certificate, made out to the LDWA, to the Recorder (no cash or stamps please) and indicate which category certificate you require and your completion date. The cost includes postage and package in a stiff-backed envelope, so do not send an SAE in this case (but always send an SAE with all other correspondence with the Recorder, please). It is most convenient if a certificate is requested at the time a completed Claim Form is submitted. Cloth badges are available for sewing onto a rucksack. 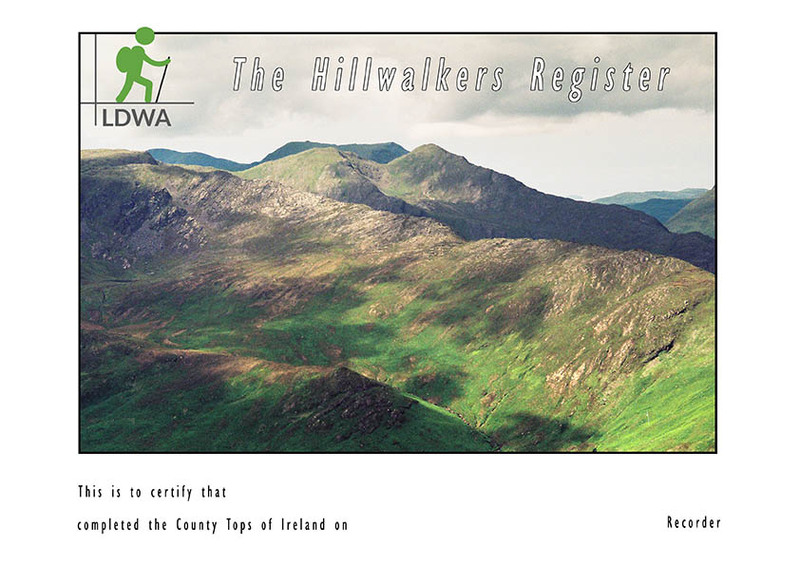 The badge shows a rucksack leaning against a summit trig column, with a hillscape in the background and bears the words “Hillwalkers’ Register” and “LDWA”. Badges, which can only be claimed by those whose names appear on one or more of the HR Registers, are available from the Recorder (address below), on receipt of a cheque for £1.50. Please include your name, address and details of your HR entry(ies), Register category(ies) and date(s). New “completers” can conveniently request a badge along with a HR certificate, when sending in their HR Claim Form.